The Ontario Divisional Court set aside the decision of the Superior Court of Justice that removed Toronto Mayor Rob Ford from office for allegedly breaching the provincial Municipal Conflict of Interest Act. The Act bars all municipal politicians from speaking, voting, or participating in any way in matters in which they had a “pecuniary interest,” which has been interpreted by the courts to mean a financial or economic interest. 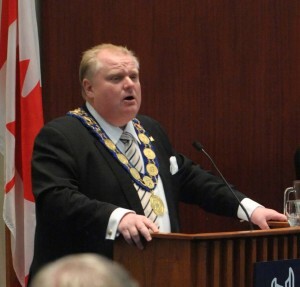 In this case, Mayor Ford had been ordered to repay donations of $3,150 made by lobbyists to his football foundation on the basis that lobbyists should not have given money to a foundation so closely related to the mayor while at the same time lobbying the mayor on other matters in accordance with the City’s Code of Conduct for Members of Council. On a subsequent motion moved by a Toronto city councillor that sought to rescind the order to repay the money, Mayor Ford spoke vociferously on the matter and even voted to excuse himself from repaying the money; Toronto council agreed. It was because of Mayor Ford’s participation on the motion to rescind the previous order of Council that he repay money that the Superior Court held that Mayor Ford had breached the Act. On appeal, the Divisional Court found that the City of Toronto did not have the power in the very first instance to order Mayor Ford to repay money given to his football foundation by the lobbyists. The City of Toronto Act, 2006 provided two possible sanctions for breaches of the Code of Conduct: a reprimand or suspension of a member of council’s pay for up to 90 days. In addition to the sanctions under the City of Toronto Act, 2006, Toronto’s Code of Conduct provided that City Council could impose other sanctions, such as repayment of money and official apologies. The Divisional Court held that Mayor Ford did have a pecuniary interest in the subsequent motion that sought to rescind the order that he repay money because he would be relieved of the reimbursement obligation if the motion passed and as such, the Municipal Conflict of Interest Act applied. This turned out to be inconsequential because the Divisional Court held that the City of Toronto did not have the authority to require Mayor Ford to repay the money in the first place. The Divisional Court said that the Superior Court judge should not have interpreted the City of Toronto Act, 2006 more broadly and generously, beyond the two clear statutory sanctions for breaches of the City’s Code of Conduct: either a reprimand or suspension of pay, but nothing else. This did not preclude the City from imposing other remedies for breaches of the Code of Conduct, such as requests for apologies so long as the other remedies were not “sanctions,” which were clearly articulated in the City of Toronto Act, 2006. The Divisional Court found that the order to repay money was a sanction and thus, not one of the two sanctions permitted by the City of Toronto Act, 2006. As such, Mayor Ford could not have had a pecuniary interest in the subsequent motion to rescind the order that he repay money and thus, could not have breached the Municipal Conflict of Interest Act. The Divisional Court did not agree with Mayor Ford, however, that the error in judgment defence provided for under the Municipal Conflict of Interest Act was available to him. Mayor Ford claimed that his error in judgment was thinking that he could speak on violations of the Code of Conduct so long as the violations did not involve the City’s financial interest. The Superior Court judge found that Mayor Ford’s actions were “characterized by ignorance of the law and a lack of due diligence in securing professional advice, amounting to wilful blindness” and that this was “incompatible with an error in judgment.” The Divisional Court held that it was not Mayor Ford’s subjective understanding of Municipal Conflict of Interest Act in the absence of any evidence of him having made good faith enquiries as to the meaning and application of the law. In this case, Mayor Ford was warned not to participate in the subsequent motion to rescind the order that he repay money, which he ignored. As a result, the Divisional Court did not interfere with the Superior Court judge’s findings on this point. Clayton Ruby, who acts for Paul Magder, the citizen who started the case, said that his client planned to appeal to the Supreme Court, claiming that the Divisional Court “let Rob Ford off on a technicality”. Read the Divisional Court (appeal) decision. Read the Superior Court of Justice decision.